Located in the main point of Warsaw, the Novotel Warszawa Centrum Hotel offers its guest modern accommodation in elegant completely renovated interiors. 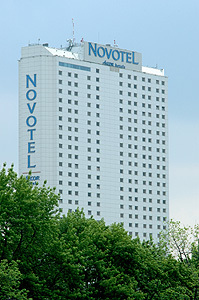 The Novotel Warszawa Centrum features 740 rooms including 22 suites boasting a new color scheme and modern furniture. Rooms for the disabled and rooms for the non-smokers are available. All rooms are equipped with air-conditioning, bathroom with a shower, Internet access, satellite TV, pay-TV, radio, direct dial telephone and mini-bar. Guests will dine in a unique â€śEssenciaâ€ť restaurant serving excellent â€śfusion foodâ€ť that is a delicious combination of many culinary traditions in one dish. Guests will relax or meet friends enjoying aromatic coffee and sweets in a relaxing â€śLe Cafeâ€ť. The â€śLe Barâ€ť invites guests to spend nice time with a cocktail. Guests will also find a news and gifts shops. For exclusive board meetings, company conventions, fair or exhibition there is a well equipped meeting area with a space of 1200 sq. m. that will guarantee a successful event. 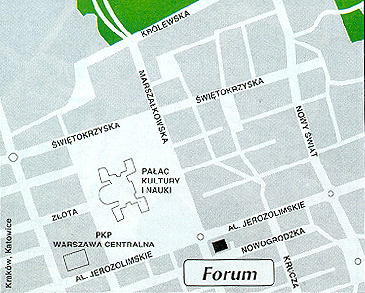 The hotel is located in the junction of two main Warsaw streets Marszalkowska and Jerozolimskie Avenue. It is opposite the palace of Culture and Science, within easy reach of the principal business, commercial and entertainment areas. The airport is 10 km away and the railway station is 0,5 km away from the hotel.